Translating the slam-bang energy of a live performance to a clinical environment of the recording studio was never a problem for the Irish blues-rocker Rory Gallagher. He'd just close his eyes and play. Not surprisingly, Gallagher's 1970 Atlantic album, Deuce, favors sweat and raw passion over immaculate audio production, and it's a brilliant argument for why prissy recording techniques don't matter when a great player is standing in front of the mic. Deuce was recorded in East London at Tangerine Studios, an 8 track facility notable for its cramped funkiness and a homemade mixing console built by legendary Joe Meek. "Rory came in and recorded about three hours worth of tracks, just to check out the studio, " says Robin Sylvester, Tangerine's staff engineer at the time. "Obviously, I wanted to do this album, so I did some 'special mixes' with hand-flanging and all these effects that he absolutely hated. He booked the studio anyway." For the Deuce sessions, Sylvester set up Gallagher's trio in a 'stage' configuration. The drums were positioned in the middle of Tangerine's tiny live room, and the guitar and bass amps were screened off with baffles to minimize leakage into the drum mics. Track assignments were: Track 1 (kick drum), tracks 2 and 3 ( stereo drum mix), track 4 (vocal), track 6 ( rhythm guitar overdubs), track 7 (acoustic guitar) and track 8 (bass). 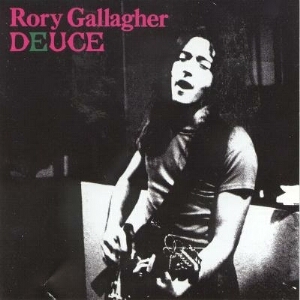 "Deuce was essentially Rory's "live self " documented on tape, " says Sylvester . "The vocals and guitar solos were cut live with the band and the only overdubs were some additional rhythm and acoustic parts. They were a very tight band, so most of the tracks were cut in one or two takes. Rory would decide which take was "the one" based on the best guitar solo. Although he was a very clear-minded producer, he left the sounds pretty much up to me. He'd ask for 'a touch more bass' on his guitar, and that was it. He liked to hear things (on tape) pretty much how he heard them where he was standing and playing." Gallagher plugged his famous, banged-up 159 Strat into a Vox AC30 with only a cheap treble boost pedal between the guitar and amp. For slide parts, he played a Telecaster through an ancient tweed Fender Twin. ("Regarding slide, Rory always said, 'glass for electric and brass for acoustic, ' " Sylvester remembers. "He swore by that.") For Deuce's country blues tunes, Gallagher fingerpicked on a Martin D-35 or National Resophonic. "Rory was a real sweet guy," says Sylvester. "I never saw him abuse anyone or anything except his Strat. He's really lay into that guitar. He'd be dripping with sweat, eyes closed, playing raw, emotional stuff- even if a session began at 10 A.M. He just seemed to switch right into it."